Google has just published the official schedule for the upcoming Google's I/O 2015, taking a closer look at the conference's schedule and sessions, it looks like Android "M" will make an appearance at this year's conference. 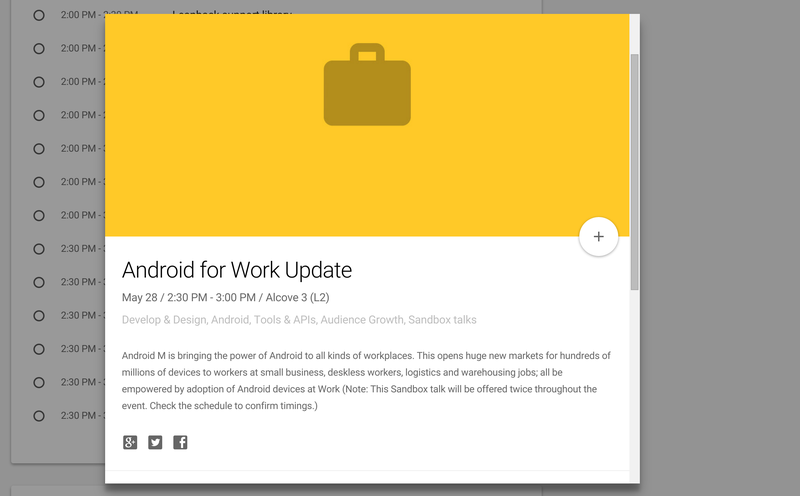 There's a direct mention under the "Android for Work" session which is scheduled for 2:30 PM PST on the 28th (Screenshot above). Also the "What's New in Android" session which is scheduled for 1:00 PM also tip-off that Google is getting ready to unveil something NEW related to Android OS. Last year's Google I/O (2014), the company showed us the Lollipop preview (Android "L"). Android "M" is rumored to be named as "Muffin". WELL Google is fast, what makes this even more official... The "Android for Work session" has already disappeared from the conference schedule, Let's wait and see! Samsung recently released the details of their CES 2016. Keynote would be held on the 7th of January and the press conference is scheduled for January 5th. There have been speculations that Samsung may announce their new Galaxy S7 smartphone in January. But contrary to all the speculations there won't be any S7 show-case in CES. The Korean tech giant will once again start its CES with a press conference, revealing its latest offerings in TV, home appliances and smartphones on January 5. For all the latest updates, media resources and content related to Samsung at CES 2016, you will soon be able to check out Newsroom's special page. 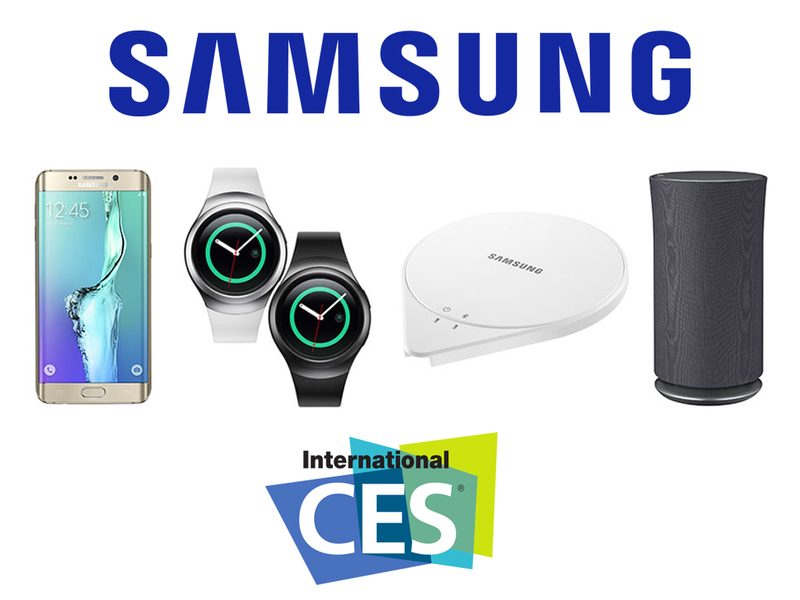 Samsung's CES-related information can also be accessed on social media by using the hashtag #SAMSUNGxCES2016. Samsung has already attained a significant level of optimization with the Galaxy Note 5 and Galaxy S6 edge+, and it would be interesting to see TouchWiz become even more efficient in the coming future (Samsung might also have plans to fix the prolonged multitasking issues present in the high end devices). The report also says that the microSD slot will come back with the Galaxy S7, but right now all we can do is wait for the device. Today, Samsung officially unveil its schedule for CES 2015. The huge trade show is fast approaching, as we're now exactly one month away from its debut. 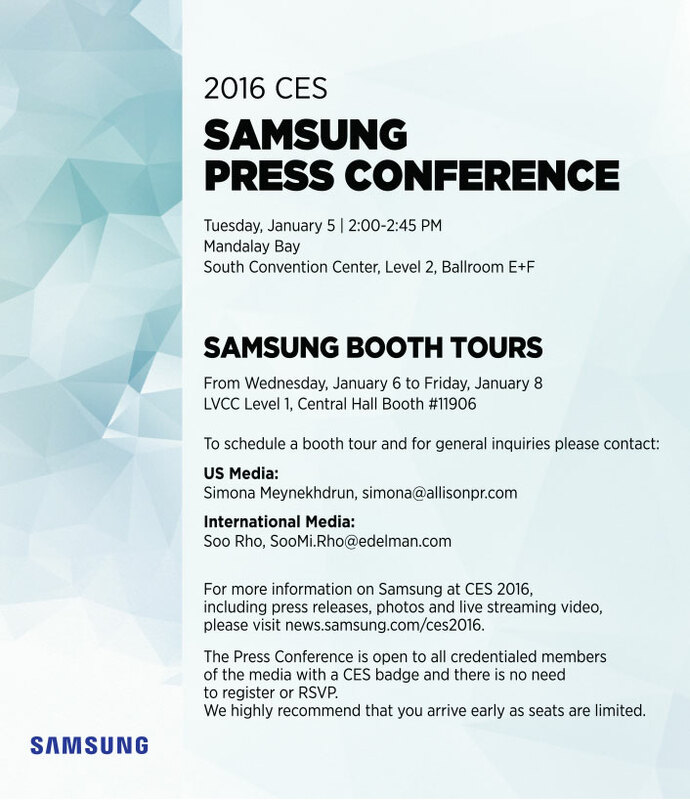 January,5th is when Samsung will hold a press conference at CES, starting at 2 pm Las Vegas Time. 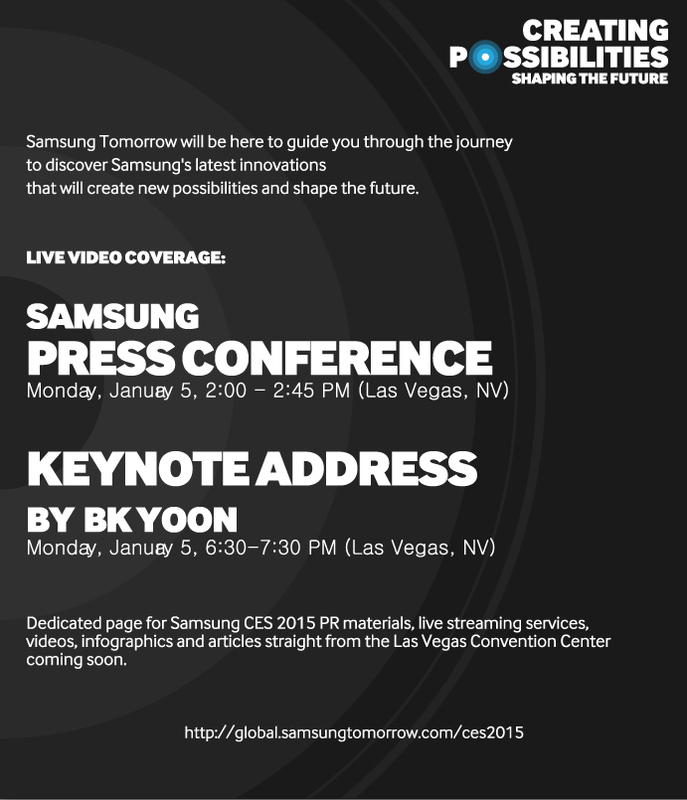 This will be followed by a keynote address by BK Yoon, Samsung Electronics CEO and President, at 6:30 pm. On the same day also, Sony will hold its CES presentation, though that will start at 5 pm. So this is shaping up to be a pretty crowded day, as the day before the trade show's doors open has always been.